Each year on the 18th of April, the feast day of St Laserian (also spelt Lazerian), sunshine or rain, the people of the village of Old Leighlin and the surrounding areas come together to take part in a pilgrimage whose roots date back to medieval times, in honour of their patron saint. I had the honour of attending the pilgrimage in 2013 when the pilgrimage was held in the evening time. This year Laserian’s feast fell on a Saturday and the pilgrimage was held in the afternoon. St Laserian as depicted in the east window of Old Leighlin Cathedral created by renowned Irish stain glass artist Catherine O’Brien. Laserian, also known as Molaise is the patron saint of Old Leighlin and his name means flame of fire. According to The Dictionary of Irish Saints complied by Pádraig Ó’Riain, Laserian was born circa 566 AD, into an aristocratic family in Ulster. His father Corieall Curaidh was part of the ruling dynasty known as the Ulaidh, while his mother was daughter of Aodhán son of Gabhrán, King of Scotland. A medieval account of the saints Life, suggests Laserian spent the first seven years of his life in Scotland before returning to Ireland to be educate by St Munna of Taghmon in Co Wexford. As a young man he turned his back on his privileged background to devote his life to God. Laserian following in the footsteps of many other Irish saints, left Ireland to live as a hermit on a small island, off the coast of the Isle of Arran in Scotland. 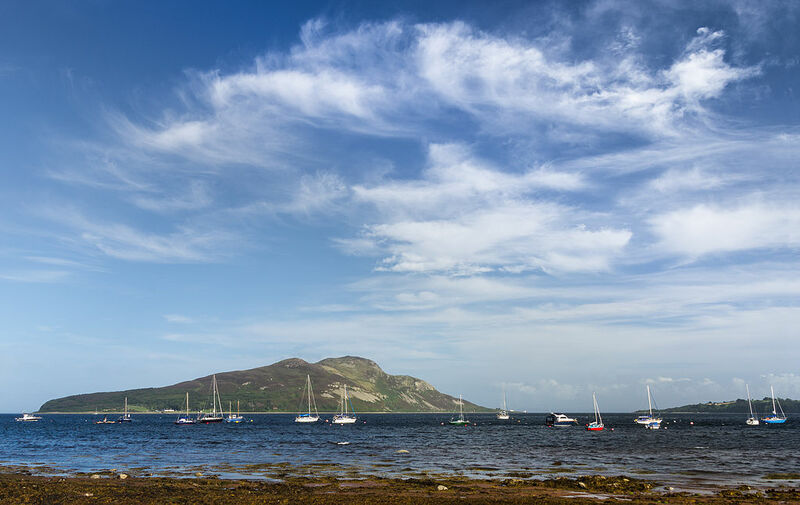 This Island is now known as Holy Island and the site of the saint’s cave in which he lived is still to be found. Some years later Laserian left Scotland and travelled to Rome where he was ordained as a priest by Pope Gregory the Great. While in Rome he was inspired to return to Ireland to preach and work as a missionary. Directed by an angel the saint travelled through Leinster searching for a suitable site for a monastery. He stopped briefly at Lorum near Bagnalstown but continued on his journey until he reached Old Leighlin. Upon arrival he found a monastery already established by St Gobban. St Gobban sensed it was God’s will for Laserian to stay at Old Leighlin and relinquish control of the monastery to him. He then set out with a small group of monks and founded a new monastery at Kilamery in Co Kilkenny. One early 20th century folklore tale from the area tells that as Laserian arrived at Old Leighlin a spring well, now the focus of modern pilgrimage burst forth from the ground. Laserian is credited with performing many other miracles at Old Leighlin and also with resolving the Easter controversy in the southern half of Ireland, at a synod held at Old Leighlin in 630 AD. Tradition holds that Laserian departed this world on the 18th of April in 639 AD. 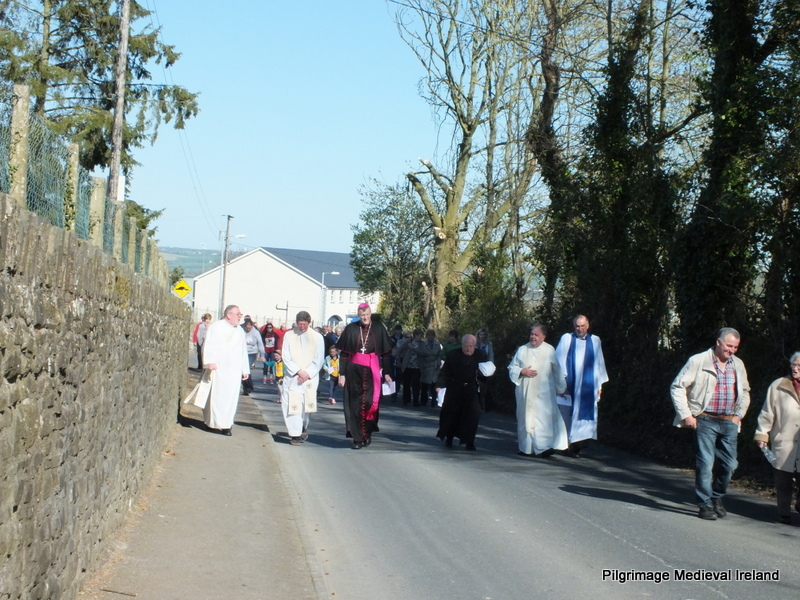 Despite the passage of time devotion, memory and connection to the saint is very much alive at Old Leighlin and each year the local community comes together to celebrate the saint’s feast day. 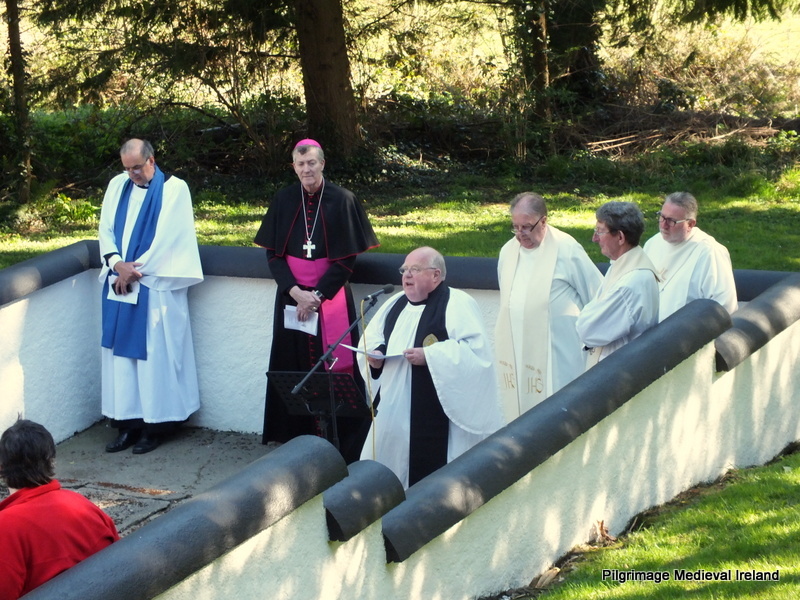 The celebration takes the form of an ecumenical service presided over by the Anglican Bishop of the United Diocese of Cashel , Ferns, Leighlin, Lismore, Ossory and Waterford and the Catholic Bishop of the Diocese Kildare and Leighlin, highlighting the importance of St Laserian within both diocese. This years’ service began at 4pm on a sunny Saturday afternoon at the Cathedral church, built on the site of Laserian’s monastery. 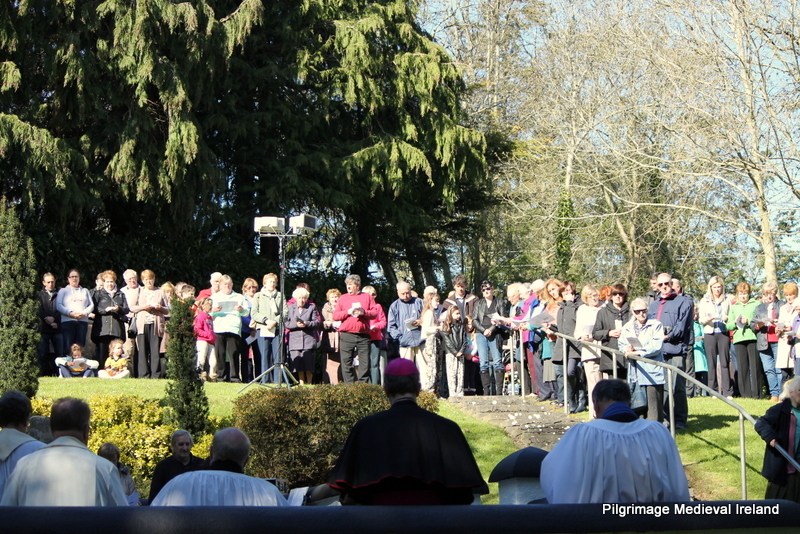 Following opening prayers and hymns, a procession from the Cathedral to the holy well was led by Bishop Denis Nulty of the Diocese of Kildare and Leighlin and Rev. Robin Bantry White representing the Right Reverend Michael Burrows, Bishop of the Diocese of Cashel, Waterford, Lismore, Ferns, Ossory and Leighlin, who was unable to attend this year’s celebration. They were joined by Rev George Cliffe, representing Rev Tom Gordon of Old Leighlin, George Kidd (Lay Reader at Old Leighlin), Fr Tom Lalor PP of Leighlinbridge and Deacon Patrick Roche of Leighlinbridge and in turn by pilgrims from both churches. The procession left the Cathedral grounds, heading up the road, through the village to St Laserian’s holy well. Old Leighlin is one of only a handful of modern Irish pilgrimages which still incorporates a procession and is a wonderful sight to behold. As the procession approached the well, the pilgrims were greeted by the music of a local brass band. Once the pilgrims had settled around the well, the ceremony continued with a reading from the gospel, poems, hymns and prayers in honour of the saint. Bishop Denis Nulty, Rev. Robin Bantry White, Rev George Cliffe, George Kidd (Lay Reader at Old Leighlin), Fr Tom Lalor PP of Leighlinbridge and Deacon Patrick Roche of Leighlinbridge. The service ended with the blessing of the waters of the well and the signing of the hymn O Great St Laserian. Many of those present went to the well to take the holy water either to drink or to carry home in plastic bottles. The pilgrimage finally ended with the traditional gathering in the local community hall for a very welcome cup of tea and a chat. 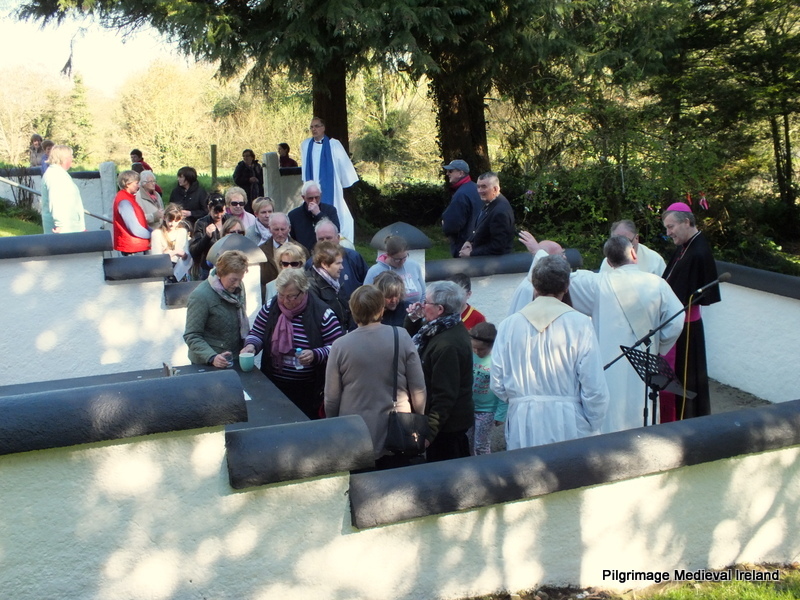 The Old Leighlin pilgrimage has its roots in medieval if not early medieval times and while aspects of the pilgrimage have changed through the centuries, a strong connection to the saint and places associated with him such as St Laserian’s holy well and the Cathedral church, remain constant. In modern times Laserian’s feast day continues to have a relevance to local people. On this day by coming together people renew their links to their saint, their locality and cements bonds and friendships within the wider community and long may it continue. Ó Riain, P. 2012. A Dictionary of Irish Saints. Dublin: Four Courts Press. I had never even heard of St Lazerian. Fascinating!